One of my greatest frustrations is trying to talk to people who prove the old adage that if you tell a lie often enough, it becomes accepted as gospel. 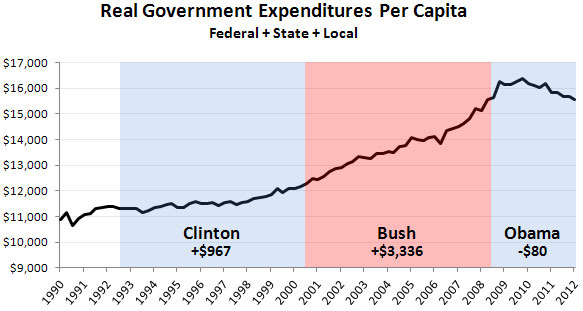 I find myself screaming at political talk shows when the deficit is discussed and the ‘fac’ that “everyone knows” we have a spending problem is repeated as if it just came down from Mt. Sinai. I want to scream that if our so-called “liberal media” really was, or even if they did their damn JOBS as reporters instead of robotic talking heads, “everybody wouldn’t KNOW”, the lie. The right-wing echo chamber has succeeded beyond their wildest dreams. If GDP has recovered to pre-recession levels, and Bush income tax rates didn’t change before 2013, then I’d expect that federal revenue from individual and corporate income taxes, as a percentage of GDP, also has bounced back. 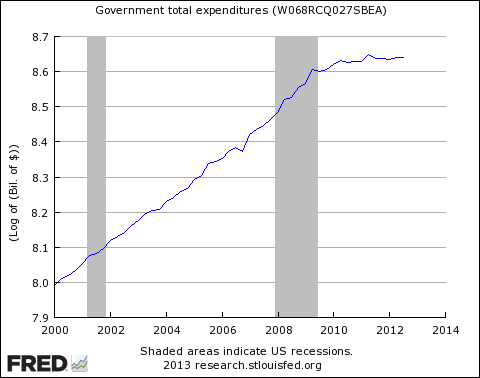 It was 11.1 percent of GDP in 2007, dropped to 7.6 percent in 2009 and 2010, and I think it remained in single-digits for 2012. This makes sense if the recovery has been unevenly distributed across sources of income that are subject to different tax rates; that is, if the recovery has favored low-wage jobs and non-wage sources of income, which are subject to low tax rates, rather than the incomes of middle-class wage-earners. Unless I’m wrong about this (surely a possibility), the revenue problem is rooted in the lack of good-paying middle-class jobs and the low tax rates on high incomes and non-wage income. Where are your numbers coming from? They don’t agree with my graph 6. Jazzbumpa, I’m referencing federal individual and corporate income taxes, as reported by OMB in the historical tables the President’s FY 2013 budget proposal. See e.g. Table 2.3 here http://www.whitehouse.gov/omb/budget/Historicals I believe your figures include all sources of government revenues (like excise taxes and Social Security contributions). I’m focusing a subset of your data to make a different, but related, point about revenue shortfalls. You’re right. I believe the FRED data does include those other things.